The Braemar Beach House is a charming family home underwent a remodel in May 2008. From the brand new ceramic tiles throughout the home to granite counter tops and new appliances in the kitchen, to the high thread count linens in the bedrooms and bathrooms, this house does not miss a step. While the inside of the house is a treat by itself, the large, fully fenced gated and beautifully landscaped backyard and patio area will make you want to spend your whole vacation here at the house. The yard area is perfect for entertaining and barbequing as it includes a commercial grade gourmet gas BBQ, covered slate tile patio and outdoor dining area with seating for 6. The yard is large enough for a game of football, catch, tag, playing in the sprinklers or just lounging and sunbathing in the California sunshine. An outdoor hot and cold shower offers a refreshing alternative for cleaning-up after a quick dip in the ocean. The beach and sparkling Pacific Ocean are less than one and a half blocks away and Sail Bay is just one block away, plus there are many restaurants and shops to explore less than two blocks away and Sea World is less than a 5 minute drive. This home has 3 bedrooms, with sleeping space for up to 6 people. The master bedroom has a luxurious Eastern King-sized bed, large mirrored closet, 48 inch flat screen plasma television with full cable channels and nightstand and reading lamps on each side of the bed. The second bedroom has another comfortable pillow top queen bed, mirrored closet and sliding glass doors with plantation wood shutters that open up to the sunny and spacious back yard. The third bedroom has two extra long twin beds, and again mirrored closet. All linens (sheets, pillows, blankets, bath towels, beach towels) are provided. The bathroom offers a full size bathtub with shower. The large living room is open and inviting and connects through to the dining room, kitchen and outdoor patio creating a very comfortable living area for the whole family. The spacious living room has vaulted custom wood ceilings with ceiling fans. The living room is fully equipped with a two comfortable couches, cozy fireplace, lots of open and sunny windows plus large 48 inch flat panel plasma television with HD cable channels/DVR and CD/DVD player for late nights watching your favorite movies. The dining room has a beautiful table with seating for 6. The full kitchen was just recently remodeled with all new appliances and granite countertops. This great kitchen has full sized range, oven, refrigerator, dishwasher and mounted microwave. This home comes complete with all dishes, glassware, utensils, as well as all kitchen utensils and small appliances necessary to prepare any meal. Plus there is a breakfast table next to the window and is the perfect place to enjoy your morning coffee. ASK us if this unit has AC! Designed for family visits, the Braemar Beach house's garage is packed full of toys to make your stay even more enjoyable - including dog toys so everyone in your family has something to play with. You'll hardly want to leave the home when you check out the foosball and air hockey tables, but if you do leave, don't forget to take the provided beach cruiser bikes. We purchased Braemar Beach house in 1976 and lived in it for two years and then moved to another home, also in San Diego. We have enjoyed this home over the years using it for short visits to the Pacific Beach area and a place for friends and family to stay while in San Diego. We completely remodeled and refurbished the house in May of 2008. 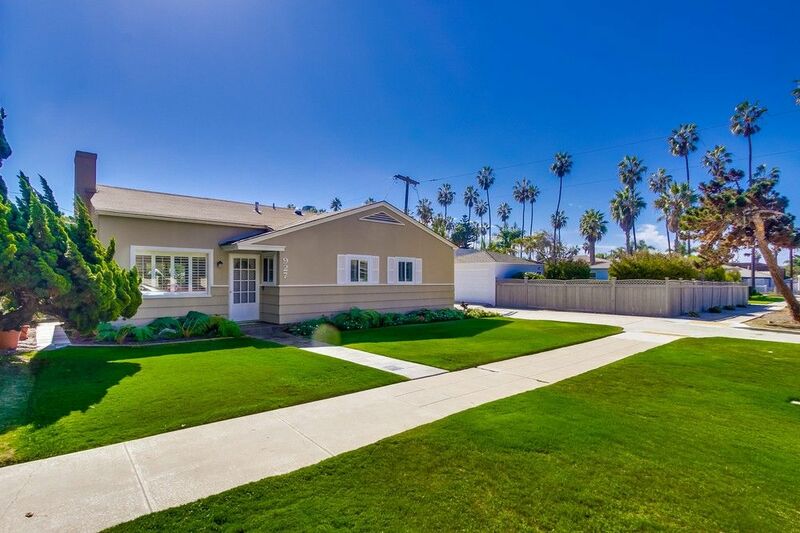 Our Pacific Beach home is located on a very quiet residential, tree lined street. A block and a half from both the beach and the bay, Braemar's location is within walking or biking distance to many shops and restaurants. We have a large back yard that is completely fenced with security gates - perfect for families with children who want privacy and safety. You will enjoy grilling on our gourmet gas BBQ and eating out on the slate patio with our special vacation lighting. There is also a warm water shower outside to rinse off after a day at the beach. This cottage is on a quiet street but near all the beach action and is stocked with everything including bikes, boards and beach chairs! Thank you, Brad. The owners of this house keep it immaculate and well maintained and take so much pride in it, as shown by the reviews. We enjoyed having you and your family there and hope you will come back again. Perfect house for our family of 5...Loved the out door shower for hosing off after the beach. Would love another bathroom, other than that the place is perfect. We are thrilled you enjoyed your stay. We look forward to your next visit. Loved the large enclosed backyard! We’ve stayed in condos right on the beach (or bay) several times and they are all the same—dark, small, noisy, and no privacy with people walking right outside your door. This wonderful house is just a stone’s throw from the Catamaran Hotel and has plenty of space with a huge yard. If you have kids or a dog, you can enjoy the yard sitting at the large patio table and relaxing in total peace and quiet. The beds were comfortable, the kitchen has everything you need, and the house is so private! The garage has a foosball and air hockey tables, wii games, boogie boards, surf boards and bicycles. You just have to walk a few short blocks to the beach. It’s really a wonderful place and we hope to be back. Perfect Spot. Gambling Garage exzellent. Only Grill Needs to be cleaned really badly, i dont think it is the Guest Job to do so. Owner Should invest little Money in new Equipment such as bikes. Nice rental. Overall our family had a great stay. Thanks for sharing Tina. We invite you to stay with us again. We thoroughly enjoyed our 2 week vacation at this cozy beach house. We vacationed with our 2 young girls and we loved having a large yard for them to play in. The covered deck and barbecue were both very nice. We also took advantage of the bikes and it was an easy bike or walk to the bayside beach. It's also very accessible to the pacific side but we preferred the bay side for our kids, the little Fanuel Park, and the quieter vibe. The actual house was also nice with comfortable beds. I've knocked a star off for kitchen cupboards having no hardware on them. It doesn't sound like a huge deal not having hardware but we really disliked putting our fingers under the doors and grip pulling them open. They also felt a bit sticky - probably from lots of hands grabbing at the same spot and it not being an overly obvious place to clean. Parking included at the house was really great and it was a nice big spot. It was easy to pull our SUV in and out of. I'd recommend this place to friends!